I've been writing every day. That's what you're supposed to do when you're a writer. Everyone says so. Annie Dillard, Stephen King, Pam Houston, Lynn Freed, Michael Chabon, Flannery O'Connor. These are people I listen to. And I always thought taking that kind of intentional step in my writing would be like practicing yoga or something, that it would lead me to a state of bliss. In such a state, I would no longer avoid the big, emotional, core issues at the heart of all good writing. In such a state, I would stop writing elaborately and learn how to cut the "scrollwork and ornament" out of my pieces, the way Hemingway says I should. After a while, those things would become second nature, ingrained in my consciousness and my muscle memory. In such a state, I would no longer shirk my responsibility, but just sit down at my desk and write. I've been writing every day, but over the last few weeks I've learned it is possible do that while still managing to avoid writing what I'm supposed to write. A) As I move forward with this whole writing thing, it's becoming more and more necessary for me to put my credentials somewhere that is easy for editors and publishers to find, so last month we launched my personal website. www.audreycamp.com . Lots of content. Lots of design. We had fun! But it did take time. 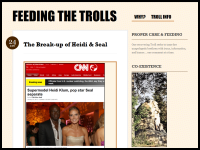 B) Last month I also launched a second personal blog: Feeding the Trolls . Trolls are people who read online news articles and blog posts, then react. Quickly and viciously. They comment and, masked by the anonymity of the internet, they find their inner censors dulled. All rules of social conduct are more vulnerable in this virtual world. The Trolls fly off their respective handles for, as often as not, no good reason at all. I've done this, too, but I've caught myself. Many Trolls fail to realize they've fallen so far. So, though I know I'm not supposed to (DNFTT! ), I am writing this blog as a response. I'm going to take on the worst of the Trolls in my own happy, virtual arena. One Troll to another. On my terms. With respect, facts, and always, always using Spell Check. C) Then, on the professional side of things, I also run The ProNet Blog . 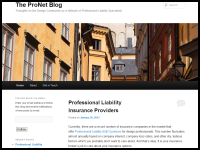 Thoughts on the Design Community by a Network of Professional Liability Specialists. a/e ProNet is a national network of brokers which provides insurance, advice, advocacy, risk management and continuing education to architects, engineers, and their consultants. Running this blog allows me to keep in touch with the design industry, one I've always thought is pretty cool. These are the things I've been writing. Every day, something. Just not my thesis work, the stuff I have to produce and spruce up in order to graduate this June. All of this is to say that I've learned how to procrastinate in my writing by distracting myself with, well, writing. Sometimes I'm so manipulative, I amaze myself. Today is Valentine's Day. I want to spend the day making my home especially beautiful and cooking up a delicious meal and lighting candles and changing the bed sheets and washing the muddy water stains off the hall floor. But the whole master's degree thing is more important, so I think I'll pack up a bag in a few minutes and go someplace outside my comfort zone to think and spread out papers. I'll pull out my red pen and work. After all, as I will ultimately rediscover by the end of the day, I'm a girl with a heart made of dreams and language. Mine is a paper and ink heart that beats faster when I return to poetry. That's what I'll celebrate today, if only I can manage to focus between now and then.